I’ve been on paternity leave since the election so haven’t written much about it. But there are a few things I keep coming back to that I find interesting. First, why was I surprised? Had I predicted the result on the day of the election, I would have said the Tories would have a majority of 60 seats. My mistake was to think opinion wouldn’t shift much during the campaign. That meant I looked for reasons not to believe polls that showed the gap had narrowed. So I wasn’t open to the possibility that Corbyn really could turn out so many young people or that the Tories could alienate so many older people. 1. The Tories made some crucial (and terrible) decisions. The social care policy was predictably suicidal. The fox-hunting pledge was bizarre. But those seem to me to be the consequence of a small group of advisors being allowed to get individual policies into the manifesto. The thing that I’m most interested by is the strategic decision not to attack Labour on the economy. In 2015 Labour couldn’t get a hearing because most voters still thought the party had wrecked the economy in 2008. When Ed Miliband said he didn’t think Labour had spent too much he was laughed at. When he forgot to talk about the economy in his leader’s speech he was mocked. I don’t believe that, had they been tried in 2015, Labour’s 2017 spending plans would have overcome this problem. What I think changed is that the Tories stopped putting much effort into claiming to be the only fiscally responsible party. In the past, the Tories have won when they’ve been disliked but considered reliable. I don’t know why the Tories made this decision. It surely wasn’t an oversight. One possibility is they tested out different attacks in polls and focus groups and found that the public no longer believed the Tories’ economic message (even though they did so in 2015). Or perhaps the Tories genuinely thought they no longer needed to bind themselves to pointless deficit-reduction targets and could win without saying much about Labour’s spending plans. Whatever the rationale, I think this decision was crucial. 2. Despite everything, May – as an individual – attracted a lot more voters than Corbyn did… It runs totally counter to how the two leaders are now seen, but Tory voters were much more likely to say they choose the party because of Theresa May than Labour voters were to say they did so because of Jeremy Corbyn. Only 1 in 3 Labour voters said they choose Labour because they thought Corbyn would be the best Prime Minister, compared with nearly 3 in 4 Tory voters for May. Even now, after more terrible headlines for May and good coverage for Corbyn, the two are tied (within the margin of error) in polls of who would be the best Prime Minister. There’s a danger of reading passionate support for Corbyn among a relatively small proportion of voters as widespread support for him as an individual. 3. … but Corbyn was essential for Labour’s balancing act (part 1, the EU). Corbyn pushed the government to accelerate its Article 50 timetable and the manifesto embraced Brexit yet Labour did particularly well among Remainers who still want to stop Brexit. Corbyn said immigration should fall yet won the support of young socially liberal voters who like immigration. How? Partly, this must have been about the Tories’ relentless alienation of anyone who embraces internationalism and diversity – with May’s mantra of brexitmeansbrexit and disdain for citizens of nowhere. But it must also have been down to Corbyn. Any Labour leader could have adopted the pro-Brexit, anti-free movement policies that Corbyn choose. They had the political advantage of stopping the Tories/Ukip attacking Labour from the right. But if a Liz Kendall or an Yvette Cooper had triangulated in this way, they would have alienated pro-Remain socially liberal voters. It needed Corbyn, who could signal internationalist values in other ways, while adopting EU and immigration policies that did the opposite. This took genuine political skill and was crucial for Labour’s result – I don’t believe another leader could have built the same electoral coalition (although other coalitions are available). 4. … Corbyn and Labour’s balancing act (part 2, the economy). I can see how scrapping tuition fees (which benefits graduates, who tend to be richer) and protecting benefits for all pensioners (many of whom are relatively well off) could be left-wing. Universal public services is clearly a left-wing thing. But I don’t think it’s so clear cut that Labour’s 2017 economic policy overall was all that left-wing – the effect of its tax and benefits policy on poorer people was almost exactly as regressive as the Tories’ plan. Under Labour’s plans, you would benefit more (actually, lose less) the richer you are, up to people who earn more than 90% of the rest of the country. Only the top 10% would lose more than people poorer than them. In this context, Labour’s help to graduates and richer pensioners has to be seen as a choice – the party promised to protect them before it offered to protect much poorer people. This may have been politically smart. Having made these pledges, it was much harder for the Tories to attack Labour from the right. And who was there to attack them from the left? Since Corbyn was Labour leader: no-one. Again, I don’t believe another Labour leader could have pulled this off. It had to be Corbyn. Despite these regressive tax and benefit policies, Corbyn was widely perceived to be offering a left-wing manifesto and so locked up the support of kind of people who were furious when Labour, under Harriet Harman, abstained on the Welfare Bill. 1. The Tories can’t run a worse campaign next time. If it hadn’t been for their huge mistakes this time (point 1 above), the Tories were on course for a comfortable majority. Assuming the Tories have a new leader and better campaign managers, Labour will face a much tougher opponent next time. 2. An effect of that could be increased turnout about older people. While more young people voted this year than 2015, fewer older people voted. Either of these might revert to the mean. An increase in turnout among older people (many of whom were presumably put off voting by the Tories’ policies on social care) would probably help the Tories. 3. The tensions between Labour’s policies and many of its voters’ core beliefs (in points 3 & 4 above) could start to undo the coalition. No-one really attacked Labour from the left during the election and this could be a risk to Labour in the future if the tension isn’t resolved (cf the way Trump used unbranded Facebook ads to suppress turnout for Clinton among young voters). Corbyn did a remarkable job. The more I think about it, the more impressive his achievement seems. The challenge for Labour now is to win an election – and it’s likely they will have to do so against a tougher opponent, who will – unlike May – take Labour seriously and will put more effort into understanding and attacking the party’s weaknesses. This is series of observations about the election result, which I found interesting and seems to conflict with some solidifying interpretations of why Labour did better than expected. It’s largely drawn from other people’s analysis, and I’ve attributed it wherever appropriate. 2. Ashcroft’s post-election poll shows 65% of Labour voters said the party’s promises were one of the top reasons for their vote. Only 20% of Tory voters said the same. 2. Labour promised to increase taxes on the rich but lost support with working class voters while gaining them among those with degrees – suggesting many people weren’t switching on the basis of their own economic interest (analysis by Paula Surridge). That said, Labour’s tax and benefit policies were barely any more progressive than the Tories’, according to (h/t Duncan Weldon) the IFS, so this may not have been so surprising. 3. Labour’s Brexit policy felt like it was governed by an Uncertainty Principle: if you knew what it was one day you couldn’t know what it would be the next. There are plenty of articles trying to understand it but beyond a headline of “accept the vote but seek a softer Brexit than the Tories” it’s not clear what the party’s specific positions are. This sounds rather like the kind of “Tory lite” position that many – including Corbyn – mocked Labour in 2015 for taking (the logic of that “Tory lite” attack suggests Remainers would shun Labour for the Lib Dems while Leavers would vote Tory/Ukip). Yet, it seems to have worked – something like 57% of those who want to overturn the referendum voted Labour, as did 42% of Remainers who now accept the result. The Tories particularly lost vote share in seats with a high proportion of 30-44 year olds – more so than those with a high proportion of under-30s. So despite the talk of a surge in turnout of students and other young people, it was those over 30 who seem to have made the most difference to the result (analysis by Paula Surridge). Corbyn’s personal rating certainly improved during the campaign, but we shouldn’t overstate how popular he became and how unpopular May became. 72% of Tory voters said they voted for the party because the leader would make a better Prime Minister. Only 35% of Labour voters said the same. It may be that Corbyn improved enough (and May did badly enough) to stop Labour-inclined people defecting because of him – but by the time of the election he still wasn’t much of a draw. Much of this is the manifestation of the growing division of the UK on cultural lines – open vs closed in Blair’s nomenclature. Despite Labour’s pro-Brexit position the party had most success in pro-Remain areas and in seats with the most middle-class professionals and rich people (analysis by Rob Ford). I suspect May’s “citizens of nowhere” line was a factor here. Only a small swing would now give Labour a majority – or, in the other direction, would strengthen/stabilise the Tories. It’s not hard to see where this might come from. The Tories have enormous scope to detoxify their policy offer. Equally, continued improvement in ratings for Corbyn should help Labour – although that could be negated by a better Tory leader. 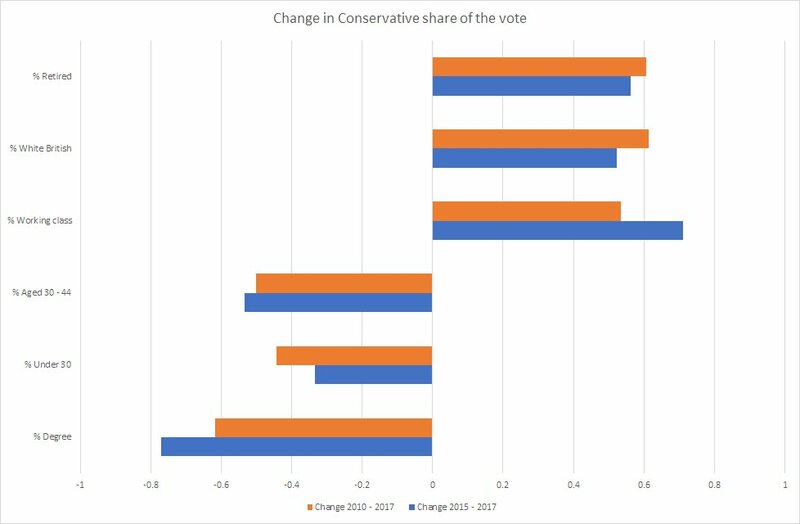 But much of the change between 2015 and 2017 seems to have been driven by how the parties now increasingly tap into the open vs closed division. This realignment might still be reversed – or it could continue to sharpen, in which case values, rather than policy details, might be the most important factor at the next election.